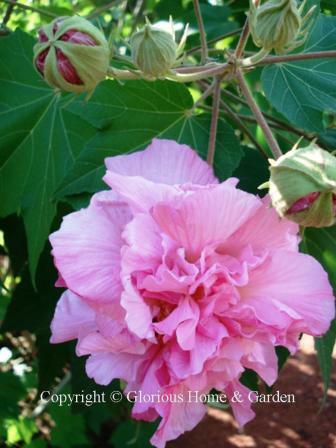 The list of fall perennials continues . . .
Farfugium japonicum 'Giganteum,' giant leopard plant, Zones 7-9. I first saw this at the Atlanta Botanical Garden where they have used it extensively in the new Southern Seasons Garden, and said "What is that!" 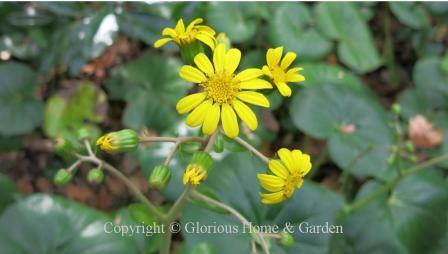 A type of ligularia, this species has huge, thick, rounded heart-shaped, glossy green leaves forming a huge clump. 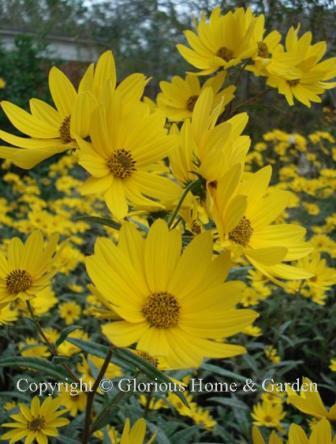 Tall stalks of yellow daisy-like flowers top it in late October into November. Gentiana andrewsii, bottle gentian, Zones 3-7. This fall-blooming perennial is a native of northeastern and midwestern North America. The curious dark blue flowers are clustered at the top of the stem and swell like bottles, but never open. If you can provide the moist soil, good drainage and cool temperatures it prefers, the blue of the flowers is beautiful. Not a good plant for the south. 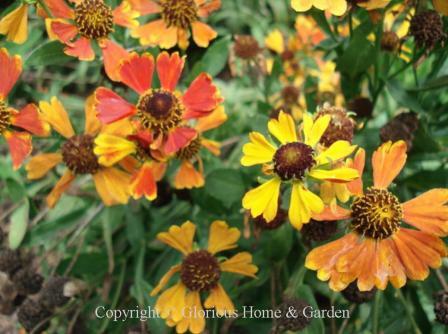 Helenium autumnale, sneezeweed, Zones 3-8. Poor sneezeweed, like goldenrod, has the rep for causing hayfever, but the culprit is really ragweed which blooms at the same time. A native of eastern North America, sneezeweed blooms in late summer into autumn. The large domed centers resemble coneflowers, but the yellow array of petals with lobed, toothy tips are distinctive. This plant gets large (3-5') and can be invasive, so dig and divide every couple of years to keep in check. Helianthus angustifolius, swamp or narrow leaf sunflower, Zones 6-9. At 5-7' tall, with cheery bright golden yellow blooms, this sunflower really creates an impact in the fall garden. 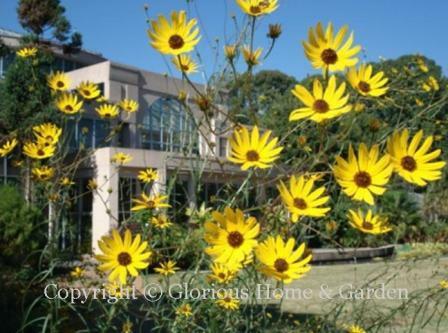 This one at Tryon Palace in New Bern, N.C.
Helianthus giganteus, giant sunflower, Zones 5-9. I've not seen this sunflower in person, but I understand that it can get 7-10'! Unlike the giant annual sunflower (Helianthus annuus) that produces huge flowerheads, this fall-blooming perennial produces a profusion of 2" flowers. Helianthus salicifolius, willowleaf sunflower, Zones 5-9. Willowleaf sunflower is similar to swamp sunflower, but has narrower leaves and is a bit hardier. 'Lemon Queen,' here at the Atlanta Botanical Garden, is a good selection. Butterflies love it! Irises are so beautiful that it is worth trying a few of the reblooming ones to enjoy them again in late summer or fall. Some varieties are more reliable than others, but the reblooming trait seems to depend on a lot of factors including zone, climate, temperature and culture. Most of the reblooming types are among the tall bearded hybrids, but there are also some remontant types in other bearded irises and Siberian irises. Here are a few tall bearded iris hybrids said to be reliable rebloomers. Consult the Reblooming Iris Society, www.rebloomingiris.com, for more information. Lespedeza thunbergii, Thunberg bush clover, Zones 4-7. 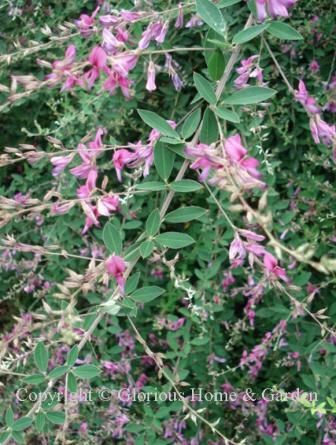 The shrubby perennial produces long arching stems laden with pea-like rose-pink flowers. 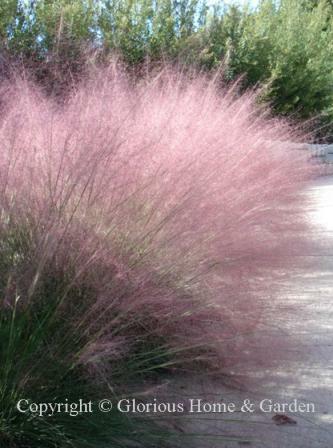 Muhlenbergia capillaris, pink muhly grass, Zones 7-9. This lovely grass, neat and quiet all summer, creates quite a show when it blooms in the fall. The airy sprays of pink flowers on wiry stems are stunning and long lasting. Great used en masse.